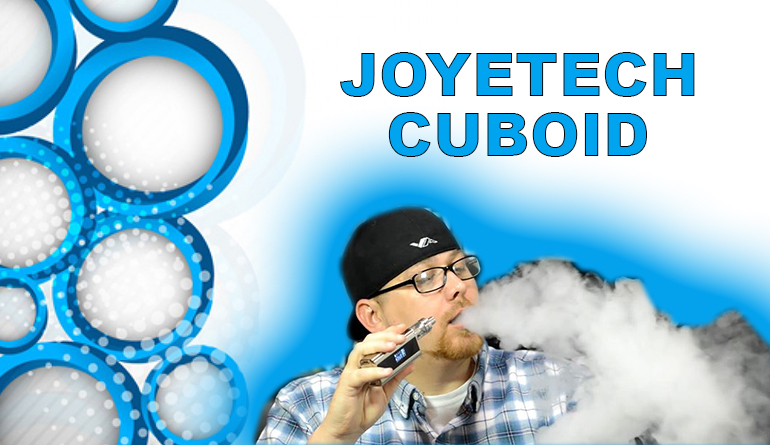 Joyetech has always been known for well performing products and they constantly deliver the higher quality of electronic cigarettes – That being said, this is why Joyetech has been one of the top leaders in electronic cigarette manufacturing. Joyetech has obviously set a focal point for the new vaper who doesn’t mind carrying a more cigar sized e-cig and the appearance of their products hasn’t been anything beyond what you see in many other brand products… until late 2012 when they released a newly designed, more discreet and look-a-like style mini e-cigarette – The Joytech eRoll. 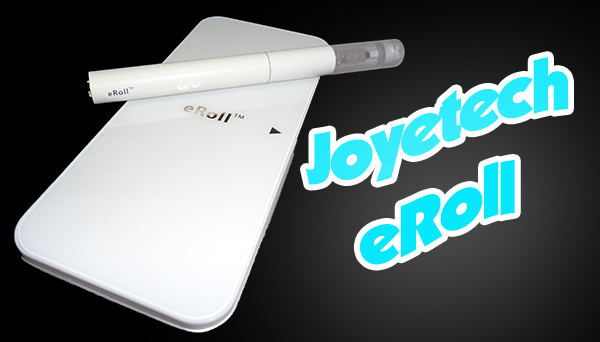 On October 5th, 2012 – Joyetech launched the eRoll, an even smaller stick style electronic cigarette than the eCab, which was launched just 4 months earlier.The eRoll being so small (90mAh battery), it couldn’t possibly keep up with a former smoker, let alone the typical vaper – which is why the eRoll comes with its very own personal charging case (1000mAh battery). The eRoll comes in a black box (much like the size of an iPhone’s) with a picture of the PCC and to the right the eRoll mini electronic cigarette. On the sides of the box marks the eRoll labeling and on each end, the Joyetech logo and the Joyetech URL “www.joyetech.com”. Opening up the box sits a thick molded plastic to hold the PCC and eRoll. Under the plastic mold is the eRoll User Manual and below that holds the USB cable, wall charger, 2 atomizer heads, 2 empty cartridges (3 atomizer heads total) and a second eRoll battery. The Joyetech eRoll Personal Charging Case or “PCC” has a sleek and modern look to it, much like you would see from an iPhone. 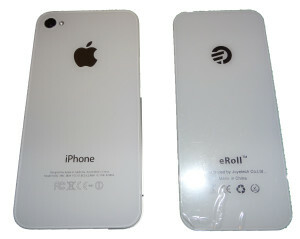 To be honest, it would surprise me to know that Joyetech wasn’t going exactly for that look – it comes in White or Black colors (eRoll itself also comes in silver), has that glossy glass (in this case, plastic) look, and even goes as far as having the metal bumper surrounding the bottom, top and sides – all looking very similar to an iPhone. On the front of the eRoll PCC is labeled “eRoll” and just beside it is a play style arrow pointing to the opening section of the lid. Below that and on the bottom of the eRoll case sits a micro USB port and two kinds of LED indicator lights just off to the right. The first LED and furthest to the left is the PCC charging indicator – the second LED and furthest to the right is the eRoll charging indicator. On the back of the PCC, looking much like the front – is the Joyetech logo sitting at the top and at the bottom sits the name “eRoll”, below that reads “Manufactured by Joyetech Co.Ltd.,” and “Made in China”. Opening up and looking on the PCC lid is two magnets, which is used to the hold the lid down to the PCC when closed. On the PCC itself, you’ll see a small and oval white button at the top (used for popping up the eRoll from its slot). To the right of the button and lining the right side of the PCC is a slot for the Joyetech eRoll. In that slot you’ll see two gold prongs at the bottom – these two prongs is how the PCC will charge the eRoll when placed in the slot and needed. When the eRoll is in the slot and needing a charge, the LED to the right will be blue – when it’s fully charged, the LED will not be lit. When the micro USB is in use on a power source and the PCC needs a charge, the LED to the left will be red – when the PCC is fully charged, the LED will turn green. There isn’t a lot to say about the eRoll itself – it’s so small and looks sleek and simple. Starting from the top, a clear mouth piece gives you the ability to see your e-liquid, below it is a ‘cone’ that covers the unique Joyetech designed atomizer head – which sits (snug fitted) on the eRoll battery. Just below the cone and at the top of the eRoll battery is a hole for airflow. Be sure not to place your finger on this hole, so that you’ll get ample airflow when taking a draw from the eRoll. On the bottom is a gold bottom cap that is used to make a connection in the PCC and is also where the round blue LED will shine from when being used. The eRoll and the PCC looks absolutely appealing. 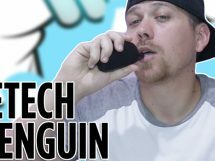 It has this modern and more up to date look to fit in with the more techy electronic products of today. From its iPhone casing look to the glowing blue LED at the bottom of this mini, the eRoll is a nice and sleek sight to look at. The PCC: The Personal Charging Case functions very well. It will typically lasts 1 days time depending on how much it is used to charge the eRoll. It takes around 3.5 hours to fully charge. The lid opens and closes just fine and stays put when closed due to the magnets. The push button to pop up the eRoll when it’s in the slot isn’t so great. It barely pushes the eRoll up and I really don’t think it was needed, though it isn’t hurting anything at all. The eRoll slot is perfectly molded giving a snug fit when the eRoll is in place. The PCC looks much like the iPhone, thus not giving it an out of the ordinary look and feel. The eRoll: The eRoll’s size is very small, but perfect for a stealth vape or being more low-key. The cartridges surprisingly works great, the atomizer head performs outstanding producing a good amount of vapor, but the atomizer cone only serves a purpose for looks and not containing any heat resistance. When using the eRoll, be very careful to not hold it at the cone or it will possibly burn you because of the atomizer getting so hot. The battery is very small and easy to change. I was completely taken back at how well the eRoll performs. 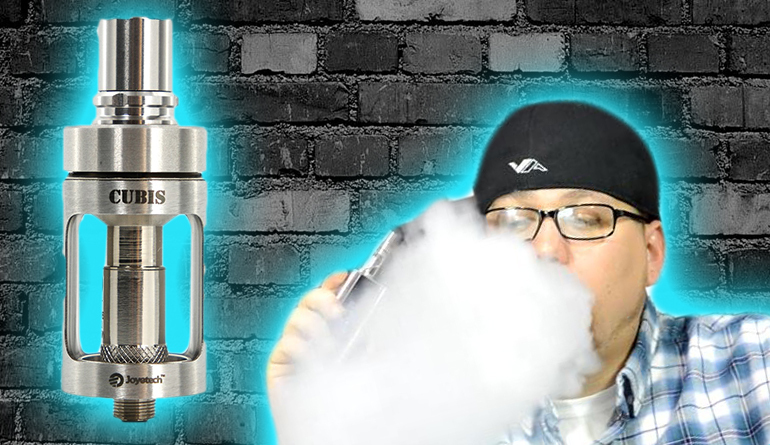 It produces a big amount of vapor for such a small electronic cigarette. Just as a tip, if you want a stronger hit from the eRoll, when taking a draw, tap over the airflow hole. This will give you a greater suction and help produce more vapor. When the voltage of the eRoll internal battery is less than 3.1v, the LED will flash 10 times and the battery will shut down. If the battery output terminal has a short circuit, the battery will not output, meanwhile, the LED will keep bright for 2 seconds. When you keep inhaling more than 10 seconds one time, the LED will flash 2 times and shut down the output. Conclusion: The eRoll is an outstanding electronic cigarette for a new vaper or even a long time vaper (My Wife has been using the eRoll at work consistently). It not only looks great, but it performs very well also. The personal charging case is the highlight of this starter kit, but the eRoll itself is pretty snazzy as well. It’s small, so it can be hidden easily or when placed inside the PCC, it can fit in with your other personal electronic devices. If I had to point out any type of flaw with the eRoll, it has to be the dangers of getting burnt from holding the eRoll at the cone when in use. It gets pretty hot. On a more positive note, I’m taken back at how much vapor this little thing can produce. I would definitely recommend this eRoll PCC Starter Kit to any smoker looking to get into the world of electronic cigarettes. 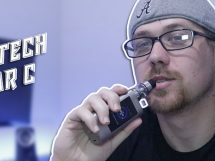 I believe this kit is great to get you started, but not hold you over a long period of time (depending on how much you vape and if the power satisfies you). As a former smoker, of about 15-20 regular cigs a day. The eRoll works great. I’ve continued to puff the same amount I would have with regular smokes. This is what I’ve found. The eRoll battery lasts me about 8 hours puffing about 8-10 puffs every hour or so. About the same I would have smoked. (I put it in the PCC upside down so it doesn’t charge.) the tank lasts about the same give or take the size of puffs I take. And the PCC lasts me about 4 days before needing to be charged. I only charge the eRoll itself when it dies. Charging takes about 30min in the PCC. I find that it has been a great substitute for my old smoking habits. I think that the people who have been giving these minis a bad rep must be constantly vaping on their ecigs never putting them down. I guess if that’s what you are going to do, then the minis aren’t for you. But if you are looking to replace your analogs for an ecig that will suit you for size and satisfaction. Go with the eRoll. Happy vaping. I couldn’t have described the eRoll any better than you have. Glad you found a device that works well for you. Thanks for the comment. hi,i am Washington ,We are a leading company with many years’ experience in e cigarettes and e-liquids export business. Our products are popular e-cigarettes, which enjoy popularity in USA & Europe markets. I can help you save a lot of money, Skype :cig-fly09,thanks.